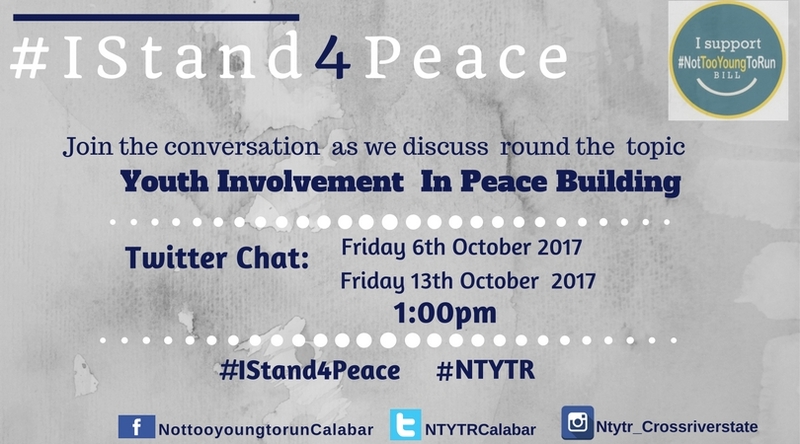 The NotTooYoungToRun Cross River State Leadership Team in partnership with MeAfrica is pleased to announce the launch of its conversational series #IStand4Peace organized as part of its activities to celebrate and promote the United Nations International Day of Peace this October. The need to promote peace is important and even perhaps more alarming, as lack of communications, lack of understanding, and self-control has led to the increasing rate of death and loss of properties in our country. In 2015, Nigeria recorded a death rate of 12.7% (per 1,000 people) as recorded by World Bank from collection of development indicators, compiled from officially recognized sources. At the same time, young people are also faced with the question of how they will address their country’s current and future violence / conflict issues, regardless of age, gender, ethnicity, culture, religion, class, caste, education, social status, sexual orientation, politics, ability or interests, and to know that all young people have a peacebuilding role to play towards a more sustainable and equitable societies, which will no doubt result in creating a peaceful environment. 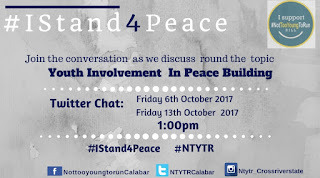 The NotTooYoungToRun Leadership Team conversational series #IStand4Peace seeks to generate greater awareness on the active roles of young people in peace-building and also to create a positive and more constructive change for peace as the recent adopted Security Council Resolution 2250 on Youth, Peace and Security marks the formal recognition of the positive role of young people for the maintenance of international peace and security. #NotTooYoungToRun Bill is a bill that seeks to reduce the constitutional age requirement for running for elective office in Nigeria. The bill with gazette number HB. 544 seeks to alter the section 65, 106, 131,177 0f the 1999 Constitution of the Federal Republic of Nigeria (as amended) to reduce the age qualification for the office of the President from 40 years to 30 years; Governor and Senate from 35years to 30 years while House of Representatives and State House of Assembly from 30 to 25 years. The Bill also seeks to mainstream independent candidacy into Nigeria’s electoral laws in order to strengthen and increase the competitiveness of the political process. Not only will independent candidacy check the practice of imposition and substitution of candidates by political parties, it will also promote issue- based politics. On July 26th 2017, the Senate passed the Bill with an overwhelming majority of 86 votes. The Bill was passed again by a large majority of 261 votes in the House of Representatives on July 27 2017. Having passed the first and second reading in both Houses in fulfillment of the constitution amendment procedure, the Bill boosted Nigeria’s image at the international level with the United Nations subsequently adopting the #NotTooYoungToRun Campaign as a global campaign with several countries implementing the campaign. Interested in working with us? Please contact our Partnerships team on +2348151977563,+2348135207082 or email nottooyoungtoruncalabar@yahoo.com.